Small ribbon necklace from Reebonz~ Perfect with my sweet dress. I've considered sewing the frills to the shoulder straps instead. Any thoughts? It won't look very perfect as they're actually next to each other, not overlapping. My go-to shoes nowadays - Scholl! Too comfy.. Matched it with a sweet pink from 3CE Lip Colour in So Pink which I got from Hermo.my for RM 65. 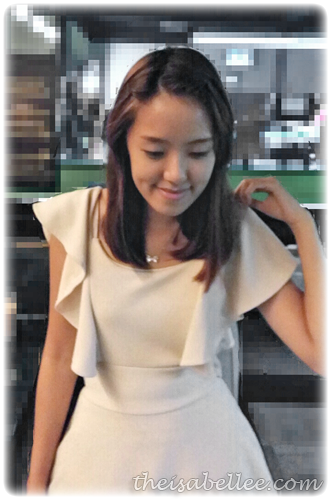 Bought this dress with the lilac cutout dress in Platinum Mall (Bangkok), if you're looking for it. The quality is quite good and material is thick and soft.